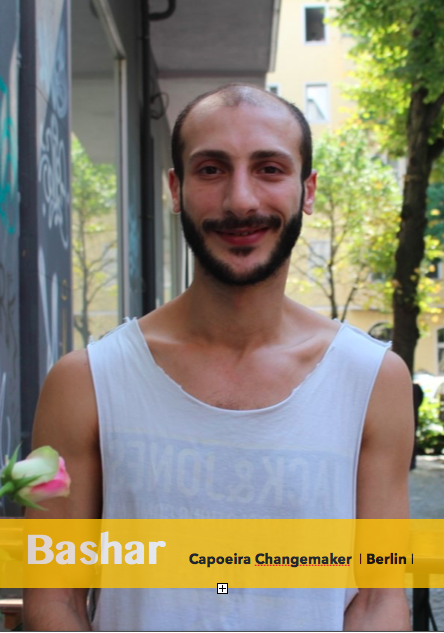 Bashar is a 29-year-old Syrian refugee who has been living in Berlin for nearly two and a half years. Despite having initially having fled the war in his country in 2012, it took him several attempts and several years to finally make it here safely to Germany. Bashar grew up in Damascus, one of the largest cities in Syria. It is clear from the offset that sports have played a huge role in his life. “I like sports” he tells me with a smile, “however, I started off with too many”. After getting bored with different kinds of sports, he remembers he was drawn to capoeira after seeing it on the PlayStation and in a movie. However, there was no capoeira in Syria – only a few YouTube videos. Bashar and some friends decided to make some their own moves. It was real capoeira. After meeting Tarek and a few of the others, Bashar became an avid player of capoeira: “For me it was always music and capoeira”. 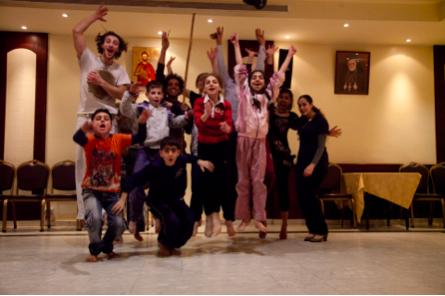 Tarek registered a local organisation in Syria CapoeirArab and was giving free classes to refugees. The classes with Iraqi children soon grew to include displaced Palestinian children. Bashar quickly became a senior trainer, he independently trained Iraqi and Palestinian Refugees, children’s’ classes, in women’s’ safe houses and in prisons. He also trained up assistant trainers (now trainers) and taught them how to build instruments, how to work with traumatised children, teaching skills and techniques. I ask him how this impacted him. “It was good”, says Bashar, “I was young, and it was really refreshing experience, a really nice idea”. “I used to dislike kids”, he says with a chuckle. “So, it is a good point, to meet these people and get to know them and learn about their experience for yourself. It had a big effect on me”. Bashar tells me that, there was something relaxed nature and hierarchy of capoeira that he was playing with the refugees that really broke down a boundary: “it was just playing most of the time, not like a real teacher or a trainer, like above someone you know. It was playful; it was equal”. Bashar’s involvement with this project ended in 2010 when he had to complete his mandatory military service. Bashar explains if you do not complete your service your papers are taken away. “In the beginning it was not too bad” says Bashar, “it was just easy kind of stuff, just the usual military service”. “Then in 2011 when the revolution started everything became much harder and dangerous”. Without his papers – which were now held by the military – his freedom was completely lost. To add to his troubles, his service had now turned into a conscription into the Syrian army and he was tasked with morally complex and dangerous dilemmas. As the situation heightened Bashar, who is a 100% pacifist, did not want to fight, he knew he had to get out. “What happened when people were caught without papers?” I ask. Eventually Bashar managed to escape the war in Syria by fleeing to Beirut in Lebanon. “I tried to escape too many times to different places, but the easiest one was Lebanon.” Now a refugee in Lebanon, he faced the same problems when he was in Damascus. Without papers he could not travel or get a job. “I was stuck there for two years”. During his time in Lebanon, he was forced to live mainly in hiding whilst he tried to register as a refugee. It was a heightened time of caution, if caught by the police, he would have been sent back to Syria. During this period, he was sharing a room with between 7 – 10 people. Access to food was also a massive issue and by 2013 he had lost a dramatic amount of weight. Despite the difficult circumstances Bashar found himself in, he was still involved with several capoeira projects. He taught capoeira to Somali refugee children in East Beirut, worked with Syrian refugees through Save the Children and gave numerous presentations on conflict resolution on his journey to Germany. He occasionally made money through teaching at the local capoeira group, Sobreviventes, which he knew through the capoeira network he had become a part of in Syria. However, he explains that “living in Beirut was so expensive, the projects cannot really afford to give you money”. Eventually, Bashar was forced to stop teaching as more and more Syrians were being stopped on the street by the police. If stopped, he has no papers and no money for bribes. the country to obtain a passport.” This was welcome news to Bashar, “I didn’t know about it before, so I asked someone inside and a mother of a friend went and found it that it would be possible for me”. With his new papers Bashar was able to travel to Berlin, where he met Tarek again. “It was a sort of coincidence, I don’t remember who told me Tarek was here, or maybe he sent something telling me he was in Germany”. Bashar then laughs telling me that he was surprised, “I am sure he had always told me he didn’t like staying in Germany”. “It felt like cycling to a workshop in Damascus” said Tarek who helped Bashar to get the class off the ground. Bashar started the Berlin Project. 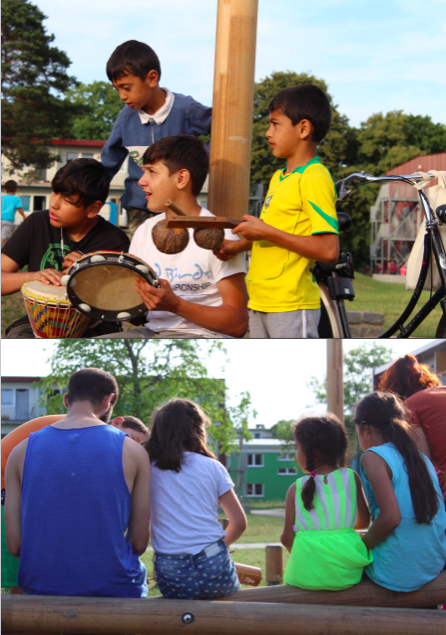 The project has been running since May 2018 at the Refugee Centre in Neukölln. Every Monday Bashar, along with a small team of enthusiasic volunteers Elisabeth, Tom, Paul Amaja and guests, works with refugee children between 5-12 years old in groups of 15-30. The children who he works with are mainly from Syria and the Balkans. You can hear the children from the Refugee Shelter Haarlemer Strasse chanting ‘Ola e lala’ one of the songs they while walking us to the gate. The project aims to improve the mental and physical wellbeing of the children in a safe space. 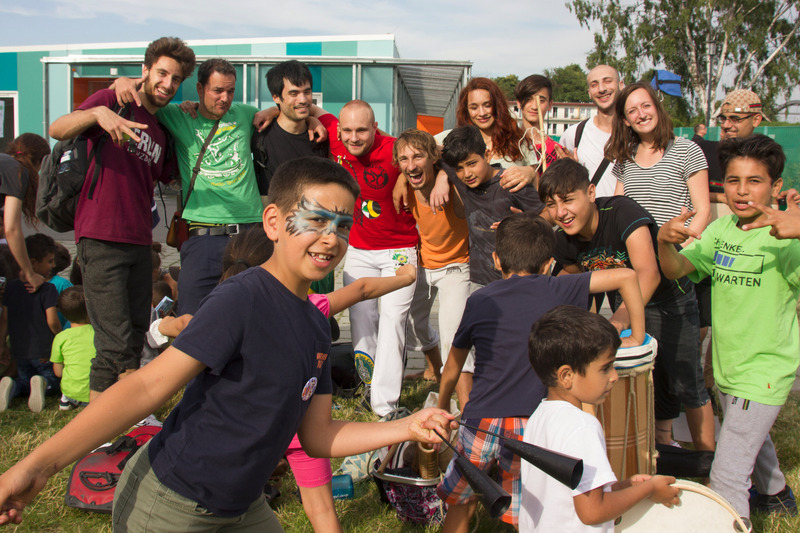 Using capoeira as a healthy outlet, they try to foster intercultural understanding and tolerance in the children and contribute to their integration into society. He smiles, “I don’t just want to give up, if I don’t have the words I start to act and give expressions. Sometimes this might be scary for them if I look crazy – but I am not giving up”. Bashar’s refusal to give up is a reflection of his determined character and strong personality. Bashar just stared another class in Berlin, Kreuzberg for underprivileged youth with mostly immigrant background and I am sure more will follow. Outside of the Berlin Project, music is a huge part of his life – he makes his own music and one day he plans to release his own album. As our conversation draws to a close, we discuss how no matter where he has gone or what circumstances he has been in, he has always been trying to make a positive change to people’s lives through capoeira. 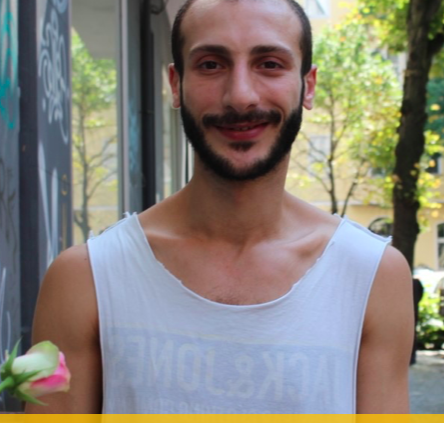 From Syria to Beirut to Berlin – Bashar laughs and informs me, “I am not as good a capoeira player as I used to be”. 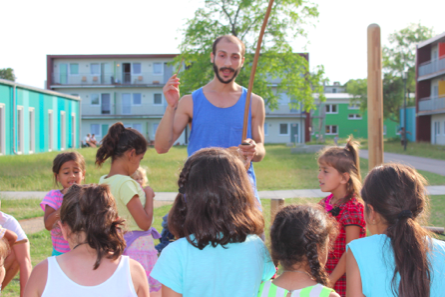 Bashar wants to grow his social capoeira project to provide more classes for the children he currently works with. Will YOU support and help him? Click to share Bashar’s story on Facebook, Twitter, or Instagram, and consider donating today if you feel inspired by his work! Photos taken and article written by Jack Anderson, C4R’s Social Media Network Coordinator– September 2018.